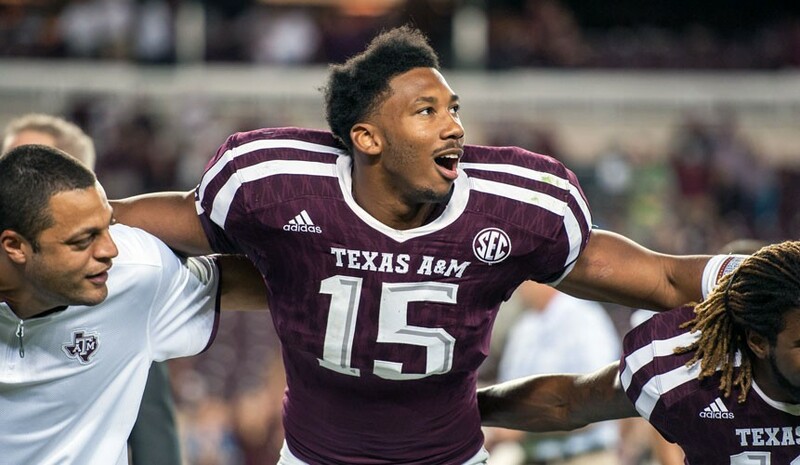 COLLEGE STATION, Texas — For a fleeting moment, Myles Garrett does not seem so terrifying. Yes, Texas A&M's 6' 5", 262-pound rising junior defensive end fills the door to the team meeting room. But he does so while wearing eyeglasses, a white T-shirt, gray sweatpants and what appear to be very comfortable moccasins. He looks almost in repose. He is definitely not in repose. First, Garrett's handshake turns your every last metacarpal into a fine powder. Then he begins talking about the Aggies' 2015 season, which began with five straight wins before plunging to an 8–5 finish. He clenches his fists as he attempts to explain how the team plans to avoid such disappointment next fall. And it's clear that Garrett's measured voice doesn't match the approach he is taking to fixing what's wrong. "Just fired up," Garrett says. "It's a big difference from last year. The mindset—guys are just so cranked into being so much better. We're so disappointed with how we left off last year. We turned it completely around, what we're doing around here. Hopefully people will see that next season." Garrett is coming off a year in which he piled up 19.5 tackles for loss, including 12.5 sacks. He sat down with Campus Rush to discuss many topics, from the roster's refreshed attitude to the leadership of transfer quarterback Trevor Knight, and made it clear he has much more meaningful numbers in mind for 2016. Campus Rush: You said the team is "cranked." What do you mean by that? Myles Garrett: Cranked as in, when we go to the weight room, or when we go running, it's almost like a different attitude. Before it was like, 'Dang, we gotta get this done.' Now it's like, who's going to win? Who's going to win this one-on-one? Who's going to get the most weight? Who's going to get the most reps? If we burn out at the end, who's going to be the guy who gets the most? It's just been different. CR: Why wasn't that attitude there before? MG: I'm not sure. I remember doing it in high school (at Martin High in Arlington, Texas) and it never really translated to college. We just did it different. Finally we're moving into this direction. And I like it. CR: Was this purely a mental change? MG: It was mental, and Trevor Knight. He came and he's helped the offense a lot. He's leading his side, and we have a lot of great leaders on our side. We've just come together and meshed as a team. And we're ready to take on anything. CR: So you can already notice Trevor's impact, even though it has been less than two months since he arrived on campus? MG: Definitely. Just the way he carries himself, how hard he works, you just want to follow him. It's great to see he has that effect on people. If he can just maintain that during the season, a great season will unfold. CR: How did that manifest early on? MG: The first workout, he caught everybody's eyes. We were maxing out, and we were doing power cleans. He said, 'I'm going to get 160 (kilograms).' He drops it. Didn't get it. He said, 'Before I leave, I'm going to get this.' Tries it three more times, and finally gets it on the third try. That was the most weight, other than a couple of other guys, that was done for power clean. The fact that a quarterback was doing it, and he's that determined in everything he does, it's ridiculous. CR: What was the most disappointing part of last season? MG: We fell short in a lot of games—we had the game. It was 50-50. And we made crucial mistakes on our end that lost the game for us. Not like we just played bad. We kind of just gave it away. It's not like (our opponent) played better than us. We just gave away the game. CR: What's the best way to fix that? MG: Discipline, leadership and ingraining it in us early so we don't have those mental errors and mistakes later on. Coaches like to push us to our limits during workouts, so when we are tired we are able to function on the field. CR: What was the biggest difference between your freshman and sophomore seasons, when offenses saw you coming a little bit more? MG: It was definitely harder, but that just means I have to work harder. It means I have to get stronger and faster. That means hopefully I can take up blocks and my other teammates can make plays. Whatever happens, if I don't make any plays that game, hopefully I can have an effect where I'm distracting two or three blockers, or I'm getting my hands up so I can bat down balls. CR: Looking back, how do you evaluate your sophomore year? MG: Could've been better in some ways. Definitely wanted to end with more sacks. I'm not really a numbers guy, but I always have a goal in mind. And I didn't achieve that goal. I just want to improve every year, which I did (from 11.5 sacks to 12.5), but I really just want to have a great year. Which I can be proud of and say, I put it all together. I did well playing the run, I did well playing the pass, got my hands up, forced fumbles, fumble recovery. I did everything right. I was all over the place. CR: So, that's what is on your off-season checklist? To be the guy who is all over the place? MG: What I'm doing right now. I'm working out with (strength and conditioning) coach (Larry Jackson) a lot. I know he's going to get me much better. Because he has dealt with great players before. Damontre Moore came out of (A&M). Von Miller was the Super Bowl MVP. You know (Jackson) has the formula for taking great players with great work ethic and making them into something even better. He'll get me where I want to be, if I just listen and do what he says. CR: Do you have any relationship with Von Miller? MG: I have met him. I'd like to actually get to sit down and talk, see how he is. Seems like a decent guy. CR: What are your personal goals, then, for 2016? MG: My dad gives me goals, and then I kind of go even farther beyond those. When I came here, I wanted 15 sacks and 20 TFLs. Last year I was a little bit short of those. This year, I want to make sure I get out of here and I break the single-season record (for sacks), I break the career record—pretty much I want to break all the records I can possible for a defensive end. I almost got the forced fumble record. I want to go down as one of the best who came here. CR: Are you approaching this season as your final one at Texas A&M? MG: Not yet. I really want to see how the season goes. Depending on that, I'll make my decision. If I have a decent year, it could go either way. CR: If last year was a disappointment, what do you have to do this year to be satisfied as a team? MG: Win it all. That's the only way you can be satisfied. Not taking a loss and going out with a win. That's everybody's goal.